The Shroobs are a race of aliens from the Shroob Planet that invaded in the Mushroom Kingdom when Mario and Luigi were babies, as shown in the game Mario & Luigi: Partners in Time, and they are the main antagonists of said game. They are a purple, mushroom-like species ruled by Princess Shroob and her older sister. Unlike the similar, yet much more benevolent Toads, who are seemingly more human than mushroom, Shroobs seem to have retained most of their fungus ancestry. Their name is a corruption of the shorted word for mushroom, "shroom". They possess very advanced technology, such as ray guns and a massive fleet of flying saucers, powered by the vim of Toads, which is collected by capturing the Toads and draining the vim through the Shroobs' Tree Network, all leading to the Vim Factory. The saucers are capable of shooting energy bolts that turn people into Shroob Mushrooms, as well as causing devastating damage to buildings. The Shroob military is very complex in their processes. They come in different colors and have different attacks. When invading the Mushroom Kingdom the Shroobs seemingly have everything laid out in advance so that they could both protect vital operations and invade enemy regions at the same time, suggesting they are very intelligent. 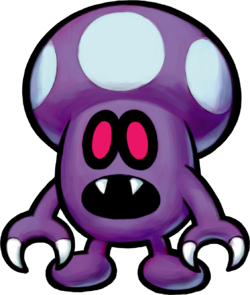 The Shroobs look similar to the Toads, except they are dark purple with bluish-white spots at the top, have very stubby bodies and limbs, have hands with pincers at the ends, have gaping mouths with a pair of fangs on the top, and have black eyes with red pupils. It has been requested that this article be rewritten to be in the correct verb tense. The Shroobs' dying home planet. The Shroobs taking over Princess Peach's Castle. 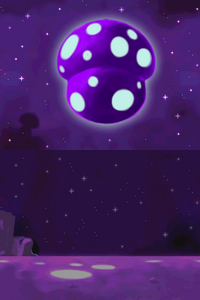 According to the prologue of the game, the Shroobs invaded the Mushroom Kingdom because their home planet was dying. The Shroobs start their invasion by destroying Toad Town and capturing many Toads. These Toads were taken to Toadwood Forest, where their vim was drained by the forest's genetically-altered trees. The vim was then collected at the Vim Factory, which is guarded by mind-controlled Hammer Bros and is where Dr. Shroobs give the vim to Swiggler, a bio-engineered Wiggler, that drinks the vim and powers the Shroob UFOs. While attacking Toad Town, they also attack Princess Peach's Castle in hopes of capturing the Princess Peach of the past, but she had left alongside with Baby Mario and Luigi, and past Toadsworth in the Koopa Cruiser by the time they got in the castle thanks to Baby Bowser, and instead found the Princess Peach of the present, and her subjects, Toadsworth, Toadiko and Toadbert, who had traveled back in time using E. Gadd's Time Machine. They took Toadiko to Toadwood Forest, and Toadbert ended up getting eaten by Yoob after ending up on Yoshi's Island (possibly suffering from amnesia right afterwards). Princess Peach, however, did manage to trap Elder Princess Shroob in the Cobalt Star, the time machine's power source, and then shattered the shards around the kingdom before getting captured by the younger Princess Shroob. Meanwhile, the Junior Shrooboid uses the time machine to travel back to the present, ending up at the throne room of the present-time Peach's Castle. When present-time Mario and Luigi travel back to the past and reach Hollijolli Village, they find that the town is attacked by Shroob UFOs, and they encounter the Shroobs for the first time. Unfortunately, the bros are knocked out by a huge energy ball sent down by a Shroob UFO, which prompts their past selves to go down to the village and save them. The Koopa Cruiser is later attacked by Princess Shroob, sending it crashing into Baby Bowser's Castle. Soon after, they start the creation of the mechanical Yoob and attack Yoshi's Island. Yoob started to eat any Yoshi it can find. These Yoshis would then most likely be converted into more monstrous Yoobs and be used to attack the Mushroom Kingdom, preventing the Yoshis from helping the kingdom in the process. However, Mario, Luigi, Baby Mario, and Baby Luigi went to go stop it, being eaten in the process after the Shroobs had used their Shroob UFOs to make Yoob grow to monstrous proportions. They later find the eaten Yoshis, Toadbert, who has lost his memory, Baby Bowser (stuck inside of a Yoob Egg), and Sunnycide, who blocks the exit of Yoob's belly. The Shroobs later commandeer the Koopaseum in Gritzy Desert, using it as a stadium in order to celebrate the conquest of the Mushroom Kingdom. On stage, Princess Shroob feeds Princess Peach to the monstrous Petey Piranha. Mario and company chase it under the colosseum and defeat it, though they learn that Princess Peach was spat out by Petey Piranha earlier and taken deeper inside the cave. Before the four can save her, however, Princess Shroob disguises herself as Princess Peach, with the intention of fooling them into taking her into the Mushroom Kingdom of the present to take it over, and thus make sure her plan would succeed. She manages to fool everyone in the Mushroom Kingdom, even Bowser, who came to Princess Peach's Castle to kidnap Princess Peach again, taking Princess Shroob with him through a time hole to Thwomp Volcano. After being defeated in Thwomp Caverns (alongside Baby Bowser, though, the Shroob Mothership comes and takes back Princess Shroob, with Mario, Luigi and their baby counterparts following afterwards. During their search for the princess inside the ship, they are surrounded by a group of Shroobs in a certain room. Princess Shroob then approaches them and takes off her disguise, revealing herself. Before she can do anything about the adult and baby bros, a disguised Kylie Koopa saves them, though they are shortly ejected out of the mothership. Eventually the bros. collect all the Cobalt Star shards and gain access to the now-conquered Princess Peach's Castle. Higher up the castle, they manage to corner Princess Shroob and defeat both her and Elder Princess Shroob, who had been unintentionally freed from her imprisonment by Baby Bowser. Afterwards, E. Gadd uses the Hydrogush 4000 to create a rain of artificial baby tears to wilt the purple mushrooms the Shroobs had planted (and turned people into) all over the Mushroom Kingdom. What became of the Shroobs after this is unknown, but the Koopa Troop manage to capture various Shroobs and keep them in a preservation chamber in Bowser's Castle. Despite regular Shroobs being the main kind of Shroob seen in Mario & Luigi: Partners in Time, only three are fought in the entire game (early on, in Hollijolli Village). Mario & Luigi battling Shroobs in Mario & Luigi: Bowser's Inside Story. In the lobby of Fawful Theater, as a hidden easter egg, just before Bowser fights Midbus, a Shroob can be seen in the seat on the lower right-hand corner. If Bowser tries to speak to it, it stares blankly and says nothing. Much later in the game, a group of three Shroobs appears as an optional boss in Mario & Luigi: Bowser's Inside Story. They are found in the cold room in Bowser Castle which needs a password to be accessed. The password of the cold room is □, □, ○, △, △, △, followed by hitting the switch on the door itself. Mario and Luigi explain their history to Starlow, then are attacked by the unfrozen Shroobs. They have two attacks that were very similar to the ones (especially the Guardian Shroobs) they used in Mario & Luigi: Partners in Time. For the first, the attacker will flag down a companion, and they will each shoot a laser at a Mario brother. The other attack is a simple laser blast, delivered to only one brother. Before executing this attack, the attacker will always pirouette, unlike in Mario & Luigi: Partners in Time, in which they would pirouette only before attacking Luigi, and spark before attacking Mario. So instead, the player must see the way it's spinning. It spins clockwise to attack Mario, and counterclockwise to attack Luigi. After defeating them, Mario and Luigi receive all ten Attack Pieces for the Magic Window Special Attack. They may also receive the Shroob Boots, which cause stomped enemies to suffer a 50% reduction in attack. Various other Shroobs are visible in the background of the battle, including broken Shroids, Junior Shrooboids, Shrooba Divers, Commander Shroobs and even Elder Princess Shroob. Also, if one uses the Jump Helmet attack and Mario and Luigi walk back in order for the attack to take effect, a single RC Shroober is seen. The secret battle with the Shroobs is accompanied by several recaps from Mario & Luigi: Partners in Time as Mario and Luigi explain their history to Starlow. After hearing that it was Luigi who ultimately trumped the Shroobs, Starlow sarcastically remarks that he did so by "ferociously crying," referencing the baby tears that were ultimately the aliens' downfall. These enemies along with the Elite Goombule and Bowser X were not in the Prima Guide Enemy Compendium. 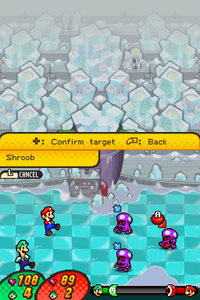 Shroobs reappear in the 3DS remake of the game, their role in the main story being the same as it was in the original game, although during the battle with them, a frozen Princess Shroob. Multiple Shroobs also appear as ranged enemies in Bowser Jr.'s Journey side-story, where they attack using their Shroob Blasters and are weak to Swoops. The Shroobs battle Bowser Jr. after he, Kamek, and Morton go into the basement of Bowser's Castle to retrieve Ever Ice. After the Shroobs are defeated, Bowser Jr. is able to collect the Ever Ice. Several Shroobs also appear later in the game when Bowser Jr. is on his way back to Bowser's Castle for the last time, some under the effects of Malatone Formula:X. In Mario & Luigi: Dream Team, a lone Shroob makes a cameo on a photo in Kylie Koopa's office in Wakeport. Although they do not make an actual appearance, the Mario & Luigi: Bowser's Inside Story sprites for Shroobs can be found in the game's files alongside other leftovers. 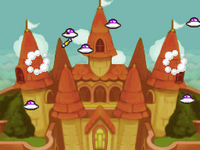 In Mario & Luigi: Superstar Saga + Bowser's Minions, a picture of a Shroob in a UFO can be found in the Mario Bros.' House and a poster for a Shroob movie can be seen in the Yoshi Theatre. In Super Smash Bros. Brawl, a Shroob appears as a Sticker that raises launch power by seven. Shroobs appear in volumes 35, 36, and 37 of Super Mario-Kun. They retain their look from game artwork, and can speak human language. The Shroob language as it appears in the text bubbles in the game is really just nonsensical small picture text. Only one phrase, which translates to "Destroy! ", is repeated throughout the game. When the Shroobs talk in the game, they make gibberish sounds. However, they do sometimes use the Latin alphabet, though possibly only having picked up that "M" is associated with their red-clad foe and "L" with the green one. In the battle against Shrooboid Brat: when the Shrooboid Brat is about to attack, when the Shroob crowd raises up signs that say either "M" or "L", signaling who to attack, and when a Shroid uses its iron ball attack, which has either "M" or "L" on it. A similar thing goes for Elder Shrooboid, when he uses the crystal attack. The Elder Shroob Princess can also speak English. Later on, the language is shown to players using subtitles in parentheses. Whether or not this means that Mario and Luigi begin to understand the language or is just for purposes of clarification is unknown. Princess Shroob with some Shroobs. Elder Princess Shroob - The stronger and elder of the two sisters that rule over the Shroobs. Princess Shroob - The younger of the two sisters, she leads the Shroobs in her sister's absence. Commander Shroob - The head of the Shroob army. Swiggler - A robotic Wiggler that turns Toad vim into fuel for the Shroob UFOs. Yoob - A giant Yoshi that eats normal Yoshis and other creatures and encases them in eggs, possibly to turn them into monsters as well. Sunnycide - An egg-like monster that dwells within and guards Yoob from attack. Junior Shrooboid - A weak Shroob that travels to the present in E. Gadd's time machine. Shrooboid Brat - A Shroob that battles at the Koopaseum in front of a crowd. Elder Shrooboid - A strong Shroob that attacks the Star Shrine. Dr. Shroob - Bespectacled Shroobs encountered at the Vim Factory. RC Shroober - Shroobs who use remote control devices to attack. Shrooba Diver - Shroobs who swim through sand as if it was water. Blazing Shroob - Shroobs with flaming heads that use fireballs to attack. Guardian Shroob - Shroobs that guard the mother ship. Support Shroob - Shroobs that aid the Shroob Commander in battle with massive Shroob-ombs. Shroobsworth - Elderly Shroobs that defend Shroob Castle along with Intern Shroobs. Intern Shroob - Little Shroobs that piggyback on Shroobsworths and aid them in battle. Spiny Shroopa - The Shroob equivalent of Spinies. Lakitufo - The Shroob equivalent of Lakitus that, instead of riding a cloud, ride UFOs. Swiggler - The Shroob equivalent of Wiggler that powers Shroob UFOs by drinking vim and sending it to the flying saucers. Shroob-omb - The Shroob equivalent of Bob-ombs, which is massive in size and is carried by Support Shroob. Tashrooba - The Shroob equivalent of Tanoombas. Shroob Rex - The Shroob equivalent of Rexes. Yoob - The Shroob equivalent of Yoshis, who is gigantic in size. Shroob Chomp - The Shroob equivalent of Chain Chomps. L33T HAMM3R BROZ. - Hammer Bros that have been brainwashed by the Shroobs via the mind-control helmets they wear. Vim Factory- A factory in which the Shroobs collect vim and convert it into fuel. Shroob Mother Ship- A ship that Princess Shroob owns. Shroob Castle- The conquered Princess Peach's Castle. Shroob Planet- The Shroob home planet. Level 3 Notice: Stats in parentheses are from the Japanese and European versions (if they differ from the original American release). Bowser Jr.'s Journey bio: Servants of the Shroob Princess who once attacked the Mushroom Kingdom. It seems that the sound of flapping wings makes their weapons malfunction. Gedonko seijin Alien from Planet Shroob; Gedonko is probably a portmanteau of gedou meaning "unorthodoxy" and "udonko disease", powdery mildew. Spanish (NOA) Champizoide From Champiñón (Mushroom) and the suffix -zoide. A reference to Shroobs was made in the Mario Hoops 3-on-3 website where one of the player's baller names (determined by a five-question quiz) could be "Shroob Showstopper". Despite being bosses in Mario & Luigi: Bowser's Inside Story, the Shroobs have the death animation of normal enemies. The same thing happens with Bowser Memory ML. This page was last edited on April 16, 2019, at 13:09.